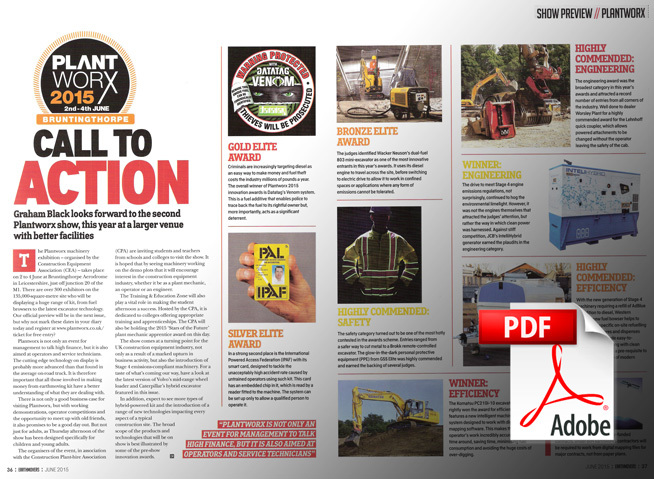 A recent feature in Earthmovers Magazine on the forthcoming PlantWorx Event, highlighed the recent Gold Elite Award presented to Datatag for the new VENOM product. Graham Black looks forward to the second Plantworx show, this year at a larger venue with better facilities. The Plantworx machinery exhibition - organised by the CEA takes place on 2 to 4 June at Bruntingthorpe Aerodrome in Leicestershire, just off junction 20 of the Ml. There are over 300 exhibitors on the 135,000 square metre site who will be displaying a huge range of kit, from fuel browsers to the latest excavator technology. Our official preview will be in the next issue, but why not mark these dates in your diary today and register at www.plantworx.co.uk/ ticket for free entry? GOLD ELITE AWARD - Criminals are increasingly targeting diesel as an easy way to make money and fuel theft costs the industry millions of pounds a year. The overall winner of Plantworx 2015 innovation awards is Datatag's Venom system.This is a fuel additive that enables police to trace back the fuel to its rightful owner but, more importantly, acts as a significant deterrent.